NC State offers a wealth of resources for faculty in each stage of their career. Due to the vast amount of information available, faculty may experience difficulty in locating exactly what they need at any given time. 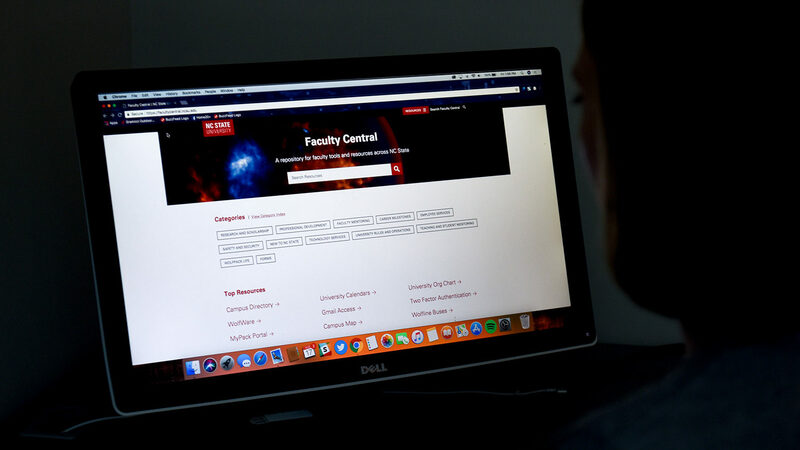 The spread out nature of faculty resources led to the recent creation of the Faculty Central website, a one-stop shop for information and tools distributed across the vast ecosystem of NC State websites. Faculty Central was developed in partnership with university faculty, Research and Innovation, Human Resources, the Office of the Executive Vice Chancellor and Provost, the Office of Faculty Development and University Communications and Marketing. The Office of Institutional Research and Planning assisted in collecting data most commonly requested by faculty and determining how to best structure this information. Members from each office involved formed a committee that identified a need to assist faculty with information-finding beyond New Faculty Orientation. A primary goal of the committee was to develop a website that didn’t create new content, but new and better ways to locate pertinent information that already existed. With Faculty Central, faculty will find information pertaining to all parts of the faculty lifecycle — from onboarding to reappointment, promotion and tenure, to retirement and everything in between. Laura Sremaniak, teaching professor in the Department of Chemistry, was one of the faculty members advising on the project. She gave input on content useful to faculty that they may otherwise have difficulty finding. At New Faculty Orientation, faculty were also introduced to how Faculty Central could assist finding information on understanding technology on campus and getting set up on Moodle, BlackBoard, the Student Information System and other useful classroom technologies. More resources will be added to the site as opportunities arise. Faculty may submit a resource to be considered for addition to the website, report a resource that is out-of-date, broken or has other issues, and submit an event to the Faculty Central calendar. Any questions and suggestions pertaining to the site may be directed to facultycentralwebsite@ncsu.edu.